A Lesson Learned but is it Too Little, Too Late? 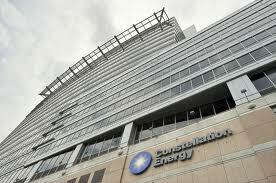 Constellation Energy, Baltimore’s only remaining Fortune 500 Company is going to merge with Exelon, a Chicago-based energy company. The merger will likely eliminate around 600 jobs, most of them in Baltimore. Shortly after the merger was made pubic, Exelon announced that it would be seeking new office space, abandoning its current home at 750 East Pratt Street. In this same statement, Exelon also affirmed its commitment to keep what was left of its Baltimore employee base in Baltimore. Several sites and proposals were considered but ultimately the soon-to-be energy giant chose Harbor Point, a 27 acre parcel just southeast of Downtown Baltimore. Exelon’s decision to develop Harbor Point ruffled some feathers in the business community. Those upset contend that the construction of a new building will saturate a downtown office space market where vacancy rates are already high, surpassing 16% as of October, 2011. Others worried that moving hundreds of employees farther from the traditional downtown core, centered at Pratt and Light Streets, would further destabilize and decentralize the business district. 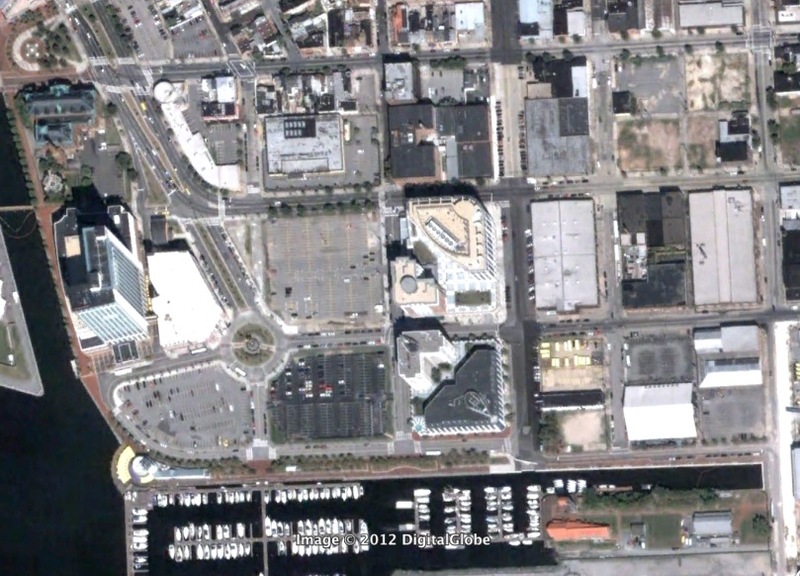 The trend of development toward Baltimore’s eastern waterfront has been happening for quite some time now. Exelon’s decision should have come as no surprise. Over the past five years, Harbor East has made itself into a destination in its own right, attracting high-end shops and restaurants and a clientele to match. The question is: why are downtown business leaders more upset by the location of a new office building than they are by the jobs that will be lost as a result of the merger? Why can’t what’s good for Harbor East be good for Baltimore’s downtown too? If we just moved the imaginary line between “Downtown” and Harbor East from President Street to Caroline Street, there might be less animosity and more cooperation in the business community. As cities grow, so must their cores, either out or up. It’s a fact of urban development. The cities, districts and buildings that grow most are able to adapt to changing market conditions and make themselves more desirable to people and businesses. An excellent example can be found right here in Baltimore. 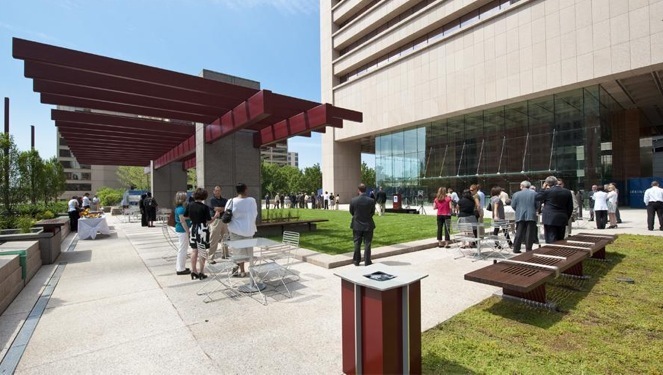 In 2009, when Legg Mason left their headquarters at 100 Light Street, the owners of the building took the opportunity to redesign the plaza surrounding the building and renovate the interior. That investment helped attract Transamerica which now leases about 140,00 square feet, or 10 floors, and has its name on the tower at 100 Light Street. Baltimore’s traditional downtown hasn’t had many buildings follow the example set by 100 Light Street. The results of this lack of investment can be seen in the eastward trend of development in the past several years. Below is a series of aerial photos which illustrates this trend. 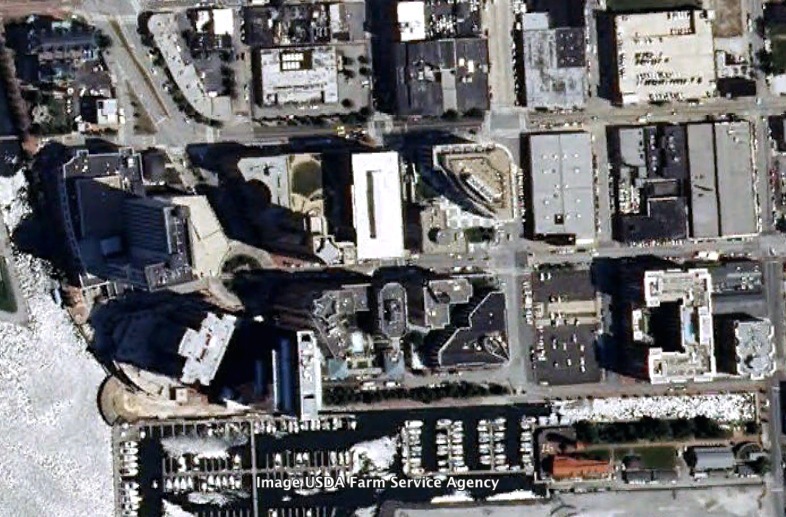 An aerial view of Harbor East in 2009, with all of the buildings either under construction or completed. Harbor Point is in a Maryland Enterprise Zone. State approved enterprise zones are designed to bring development to areas that otherwise would not attract it. As a result, the benefits associated with building in an enterprise zone are pretty generous: the business owner is entitled to an eighty percent tax break for the first five years with the rate diminishing by ten percent in each successive year for five more years. The result is an estimated $64.5 Million in savings for Exelon due to the state enterprise zone. Tack that onto the $155 Million in Tax Increment Financing (TIF) the City has to spend to get Harbor Point ready for development, build open space and add roads to the site. That’s quite a bill. Indeed, the amount of money being spent to develop a parcel that should sell itself has many Baltimoreans up in arms, and rightfully so. It’s hard to believe that no one saw this coming. When development trends showed that Harbor East and Harbor Point were becoming desirable locations for development, why didn’t anyone remove these areas from the list of state approved enterprise zones? This particular lapse in oversight is a costly one. 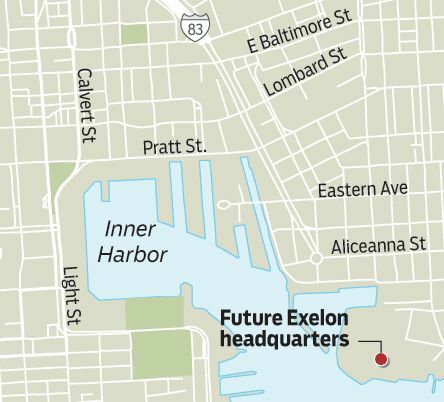 Given what development trends in Baltimore have looked like over the past ten years and the amount Exelon stands to save on taxes, it really shouldn’t come as any surprise that Exelon selected Harbor Point. Even without the development trends and the tax-related savings, Harbor Point is still an amazing site. It’s surrounded on three sides by water and it sits between Fells Point and Harbor Point two of Baltimore’s most desirable locations. The site is also a whopping 27 acres, allowing Exelon’s imagination to run wild. Some criticize how Exelon selected its site, charging they sought features one would expect in a suburban location including ample parking spaces and open space. These criticisms shouldn’t hold much water as they are features every good developer wants. The fact of the matter is, Exelon got a great deal on a great site. City and State government reacted too slowly to real estate trends to take advantage of Harbor Point as a source of tax revenue. The real question is, has our government learned from this mistake? The State and especially the City cannot afford to make such huge concessions to developers. A large part of Baltimore’s transformation has been taking industrial sites and making them into developable land for retail and office space. 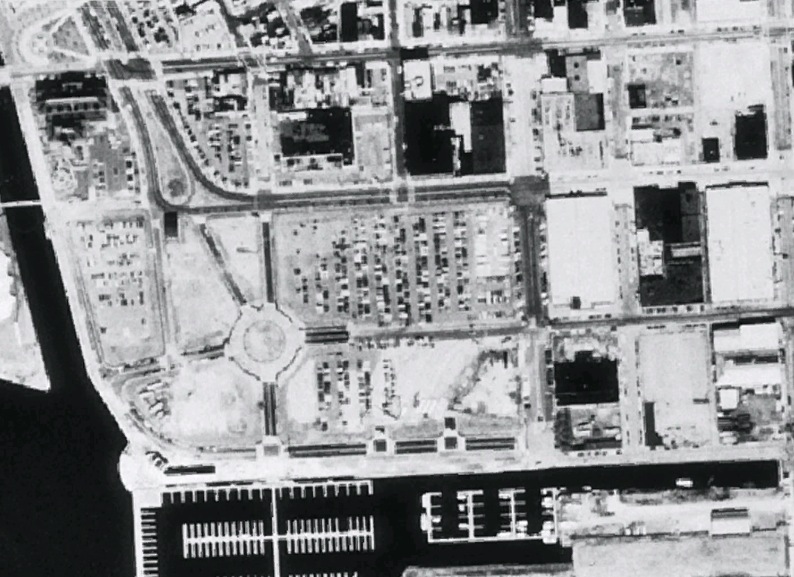 Until 1985, Harbor Point was the site of Allied Chemical’s chromium factory. A view of Harbor Point when Allied Chemical still had a factory on the site. 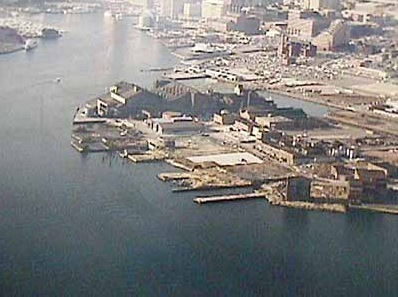 In 1999, the Environmental Protection Agency completed a cleanup of the site which resulted in a “cap” being placed over the top of the site, preventing rain water from leaching chromium into the harbor. When completed, the site is expected to include about 1 Million square feet of office space, 150,00 sq. ft. of retail, 600 residences, 250 hotel rooms and 3,000 parking spaces. Exelon’s building is expected to earn a LEED Platinum rating, the highest available award for green building. The site will also include 11 acres of open space. Despite the lost tax revenue, in the long run this project should be good for the City. As Harbor Point is the last developable waterfront property, investment should shift back North and West toward the City’s core, which will strengthen as a result. Short term benefits include thousands more people coming “downtown” every day to work, eat and, hopefully, live.